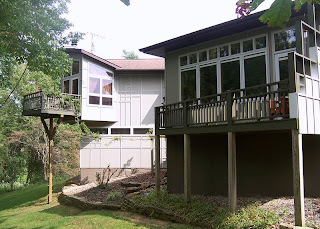 This project was a large multi-level contemporary home nested naturally on a slopping hillside, overlooking a lake, with ornamental gardens on a beautiful wooded lot. 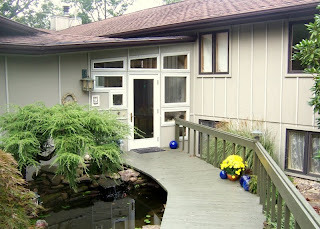 The harmony with its surroundings is near perfection, with the home owners taking advantage of the large over-sized windows and multiple decks to appreciate the landscape. 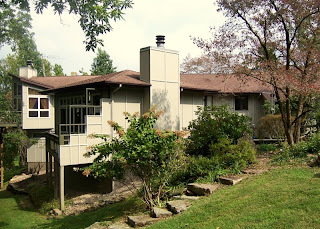 The house design is unique in many aspects, with many levels and angles that one would expect to see in a postmodern contemporary, but also has the added character of its owners, a prominent physician and professional artist. 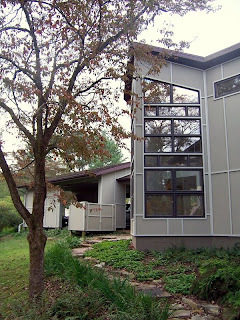 Their personal touches truly make it one of the most unique homes in Southern Illinois, reflecting the artistic vision you would find in a truly original, architect-designed postmodern home. Our project was to give this beauty a face lift, a new coat of paint and put it back into good order for many more years of enjoyment. 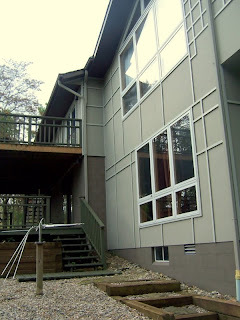 Most of this home was still wearing its original paint of nearly twenty years! And although we did have several of the common house paint problems, it was generally in good shape, a testament to the quality of this home builder. For our make ready, we had years of grime, dirt, and a small amount of chalking and mildew to remove before we could apply the primer coat. We went through our normal process, a light house wash, a scrubbing of cleaning solution, and a final rinse with clean water. We paid special attention to areas around the landscape water features making certain that we killed and removed any mold or mildew. Overall a basic prep job, just a whole lot of it. Good preparation is the only way to insure the quality and longevity of any paint work. Not a step to be skipped or skimped over. 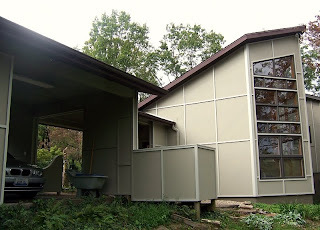 Click on the image for an enlargement of the house wash.
As you can see a pretty dramatic change. 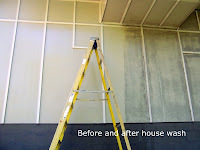 Our next step was to address any major problem areas that needed scraping or repair. There were a few areas of water damage requiring some light carpentry work. The siding on this home is made of 4x8 and 4x10 panels with the seams covered with 1x2 battens, forming different geometric patterns becoming a subtle architectural feature. With this type of design feature, loose joinery can be problematic. Any places water can get behind need to be resolved. 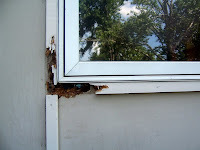 So we removed the rotted wood, replaced it and made certain it was sealed and tight. All buttoned up and ready for paint as we like to say. At this point our major prep work is complete, or the “make ready” done. 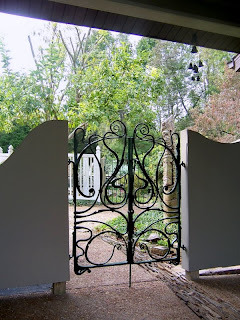 To explain some of the painter’s lingo as you go thru the process of painting a house there will always be areas that will need preparation at different stages, the primer stage, the finish coat stage and the trim stage. The make ready is about the reconditioning of the exterior, clean surfaces, treatment of mildew, carpentry, caulk and seal. I have to bring up one issue we see time and time again, that being the abuse and use of caulk. Way too often people try to affect a repair in a carpentry problem such as a water leak with large beads of caulk. And end up with nothing but a cosmetic cover up, usually aggravating the problem further and just trapping more water behind the material causing dry rot. A painter uses caulk to seal a joint, and levels the bead of caulk to the surrounding material producing a clean water tight seal that blends into the area leaving a smooth transition. 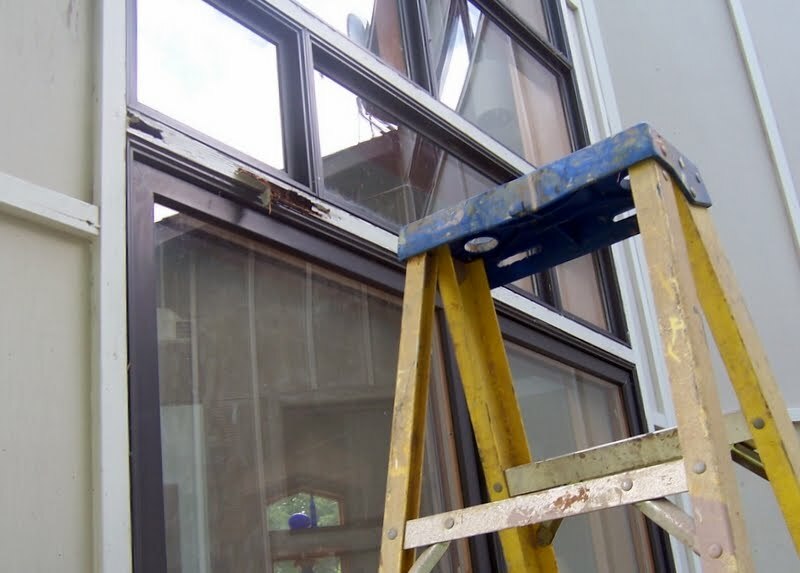 There are certainly calking materials that are used around window and door sills, or construction adhesives used to seal framing areas applied in a high build up. But this should not be confused with painters prep and caulk and is not a fix for poor carpentry skills. Lucky for us this home was extremely well built and even with several elevations and walls facing every compass point known, the majority of repairs were fairly routine and common considering its age. Our next stage, give the home a good primer coat of paint. The primer is mixed to match the final color coat, which will help give us a very nice uniformed finish with enough mills of coverage to ensure a long lasting, durable paint surface. The color choice for this home was to keep close to the original paint scheme, but punch it up just a little increasing the color intensity a small amount. We used an earthy palette (Monterey Taupe) and a custom mixed umber white on the trim. Certainly natural colors you would find in the surroundings. 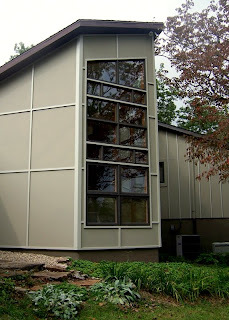 The trim on this home has a unique feature of 1x2 battens that form a Mondrian pattern of squares and rectangles. 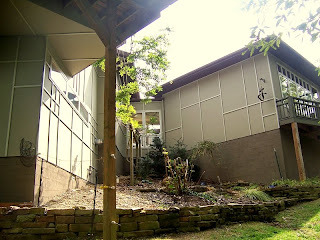 The composition changes throughout the exterior, forming different designs and accents. 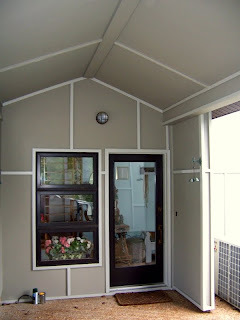 The color choice for the trim must be restrained and balanced with the body color. We wanted a quiet value and color contrast that would be fairly low key. We mixed several combination's on site and applied test strips to an area that would be in sun and shade so that we could visually see the changes in lighting effects. 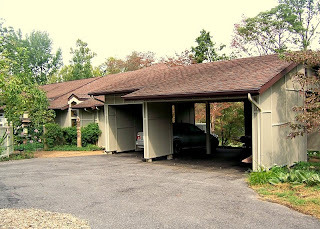 Once we had a tint that worked well in all light we had our paint store match the color. Thru the stages of this job, the wash, prime coat, finish coat and trim work, we circled this home four times with long ladders. With several stories, complex angles and multiple landscaped hillsides to contend with, this was certainly not a project for the novice or do-it-yourself-er. 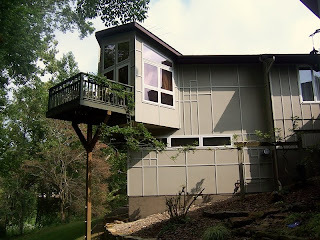 Custom homes like this present special challenges. However, the satisfaction of working on a fine quality home does have its own rewards. 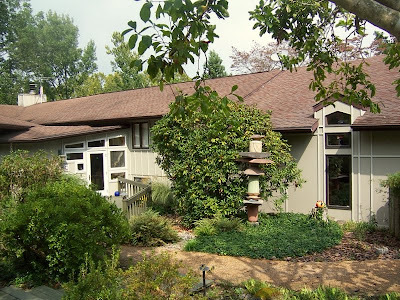 Working with owners who take great pride in the exterior landscape of their home and recognized that the paint work is part of that overall aesthetics make big challenges like this a fun project. In the end, all parties are happy with the professional results and our efforts. 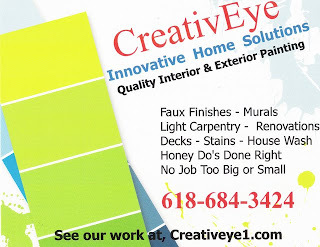 Another win-win for CreativEye and our clients. The end results we feel speak for themselves. 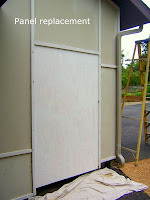 Thanks for visiting and be sure to contact us for your next project. We are professional artists that work with you to create unique artistic finishes for your home, whatever your vision is. From simple quality Wall Painting, Venetian Plasters, and Colorwashes, to outstanding Murals, our unique knowledge and artistic craftsmanship will help you “visioneer” your home or commercial space into what your imagination sees. ...in our unique services please use the contact information tab above. 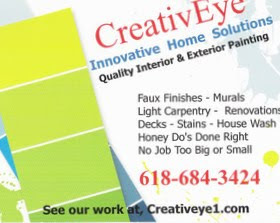 If it's one room or a whole house, a fresh new look for the living room or a full exterior paint, no job is too big or small for CreativEye.